The Twin in Berlin: Heavenly Father Is Looking Out For Me. Heavenly Father Is Looking Out For Me. THIS IS THE FOURTH TO LAST REAL EMAIL I WILL SEND HOME. So next week we have a zone conference innnnnn LEIPZIG!!!! Yesssss victory!!!!! We are right in between Berlin and Leipzig, and I was just praying that we would get to go to Leipzig. AND WE ARE!!! (this means I won't get to see Sister Murdock and her Trainee though, that's the only sad part) BUT alas. I just can't stay away from Leipzig. That's not till the 11th. still time before that. SO THIS WEEK WAS COOl. We visited Ruphi, our investigator from Camaroon. We talked again about the Restoration, and watched the movie with her and her seven yr old son. She loved it. In the middle of the movie, her son looked at me with his big brown eyes and asked "Ist das in wirklichkeit passiert?," "Did that really happen?" and I just felt so good that I could answer with a simple but confident "yes." I felt the Holy Ghost confirm to me that Joseph Smith indeed saw God the Father and Jesus Christ, and that They spoke to Him. This is really the truth that we are sharing with people! Not just a pretty story. I feel so blessed that I can share my testimony of the Restoration. Later this week we helped Ruphi move to another apartment across the street. AND miracle, the young member in our ward who is also from Camaroon was randomly there helping too!!! TOTALLY COOL. We have been trying to make something out for them this week, but this week Heavenly Father made it happen. She was so grateful for our help. I love her so much. We are just praying that when she is settled this week that she can make it to church next week!!!! She is so close to God, I love her. Our little family Mit is also doing well. They made another week in Germany, so that is good! I really hope they can stay here until March at least. We were able to talk with just the wife about the Priesthood and Baptism, and she totally understood it. 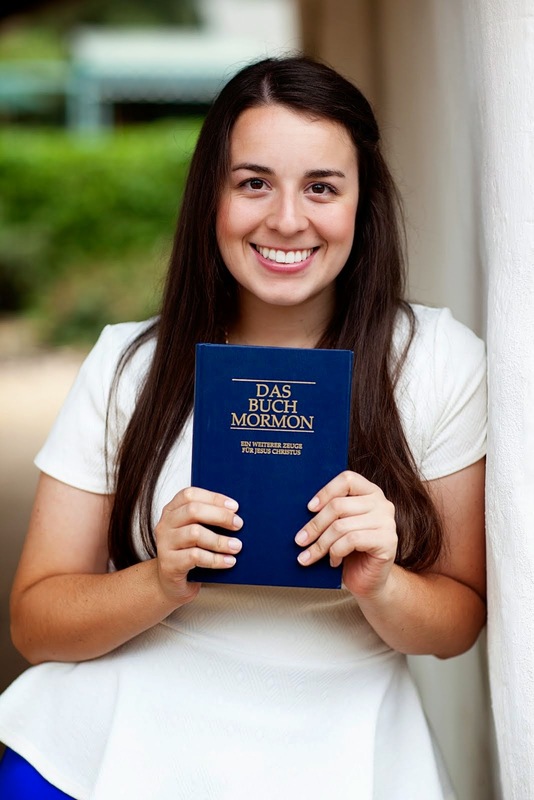 The language barrier is still a challenge, but we were able to determine that she does want to be baptized and that she understands the relationship with Joseph Smith and the restored Priesthood. Her husband was already baptized at some point in another church, but she understood, and was able to explain to him later, and THEY GET IT. Man sometimes I kind of feel like they have no idea what we talk about, but this week we layed fest that they get it. It may not happen until they are back in Macedonia, but I am just so glad to be able to teach them and know them. The elders came with us yesterday to give them all Priesthood blessings. That was a really spiritual experience. I know Heavenly Father loves this family so much and will help them stay strong. They are so humble and so faithful! We were able to stop by a less active Vietnamese family who invited us in to join their visitors for a meal of Vietnamese foood. Some of it was good but some of it made my tummy a little sick. Haha, but the husband was talking a lot of Heavenly Father's love for His children, it was a really tender mercy that we could visit them. Wednesday I was so exhausted and had a hard time talking with people. We were waiting for the bahn to come later that night, and I was just rubbing my eyes and praying for help to stay alert, and then (as I was praying) the little lady next to me started talking to me. it was such a miracle for me! We were able to have a nice little conversation about Cottbus, and what we do as missionaries. Nothing huge happened, but I felt so good and it was a sign that Heavenly Father is looking out for me. Challenging part of the week: RAIN. Best part of the week: feeling God's love for the people here. And good food. Things I will miss: riding the straßenbahn everywhere, how serious the ward members take greeting everyone in the ward before church, and just how much chocolate you can get at the store. I love being here. I treasure this time to share my testimony with others, and to share my knowledge of the Savior. This week I have tried to thank Heavenly Father more for Jesus Christ, and His Atonement. I will never be able to say enough about my Savior. I know He lives, and I know He loves us. He is so ready to help us and to heal us. I Love Germans, And This Country So Much!